Honduras Claims Unwanted Title Of World's Murder Capital : Parallels When visiting San Pedro Sula, the bloodiest town in Honduras, it's advisable to arrive early in the morning, when the drug gangs are still asleep. 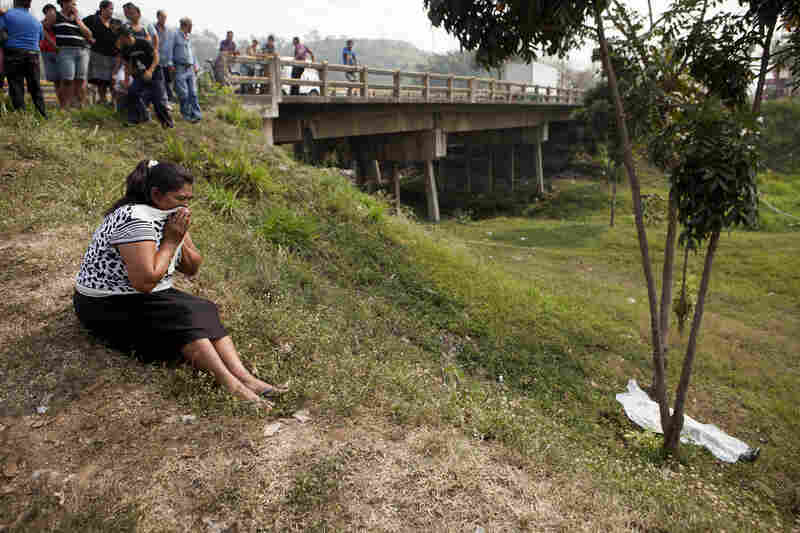 A woman cries near the body of the Justiniano Lara, 51, after he was killed by unidentified assailants in San Pedro Sula, Honduras, on March 25. With 91 murders per 100,000 people, the small Central American nation is the most violent in the world, and San Pedro Sula the most violent city. 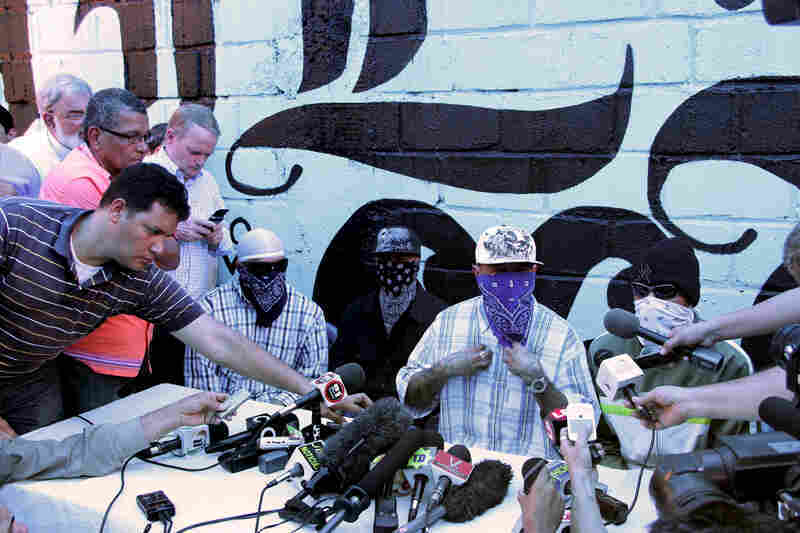 Members of the 18th Street gang announce a truce during a press conference at a prison in San Pedro Sula, on May 28. The gang is involved in drug trafficking that has brought terror to El Salvador, Guatemala and Honduras. 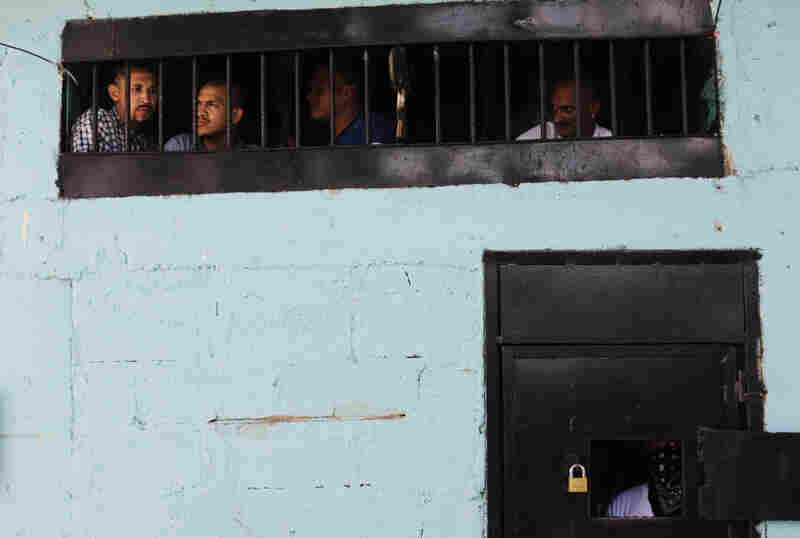 Members of the Calle 18 street gang look out from their cell at the prison in San Pedro Sula. The prison houses the country's most violent criminals. 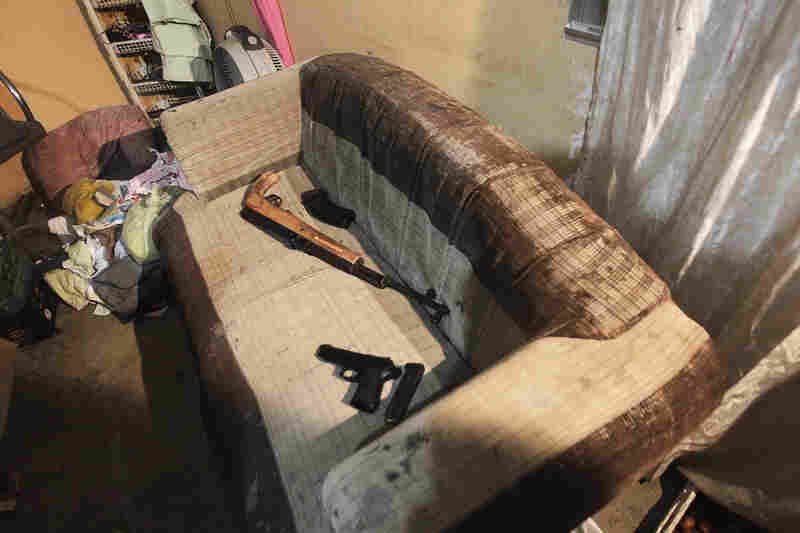 Confiscated weapons lie on a couch after the arrest of several members of the 18th Street gang after a shootout with police and military during an anti-drug operation in San Pedro Sula, on March 27. San Pedro Sula, the country's second-largest city after the capital, Tegucigalpa, has a homicide rate of 169 per 100,000 people and was named the world's most violent city for a second year in a row. 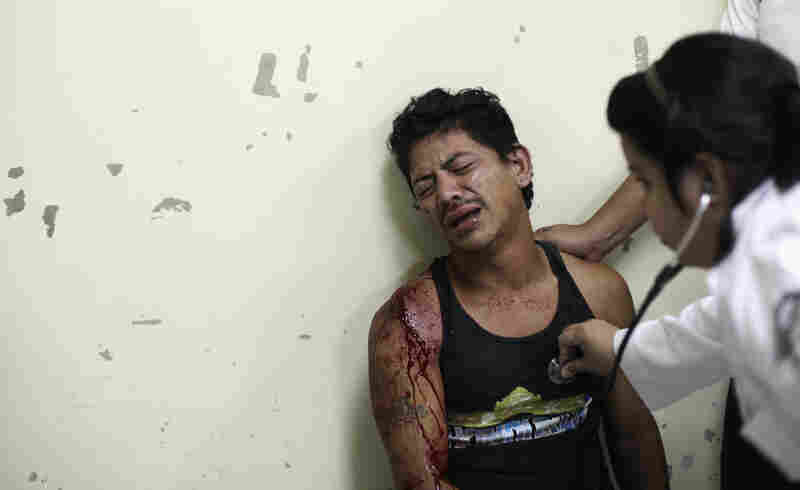 A man reacts as a doctor treats his wounds after he had been attacked by a gang in San Pedro Sula, on March 28. 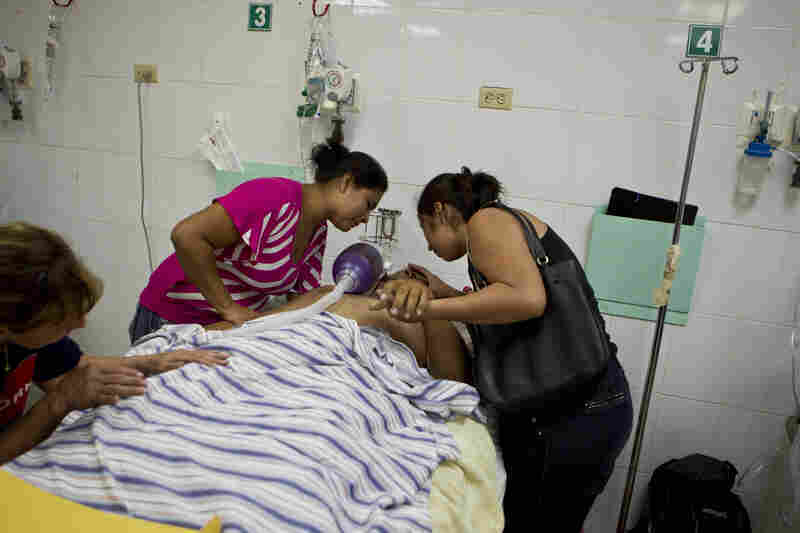 Relatives of Carlos Pineda, 30, cry over his dead body after he was shot in the head and spent an agonizing day at the emergency room of a public hospital in San Pedro Sula, on March 25. Latin America is riddled with crime, and no place is more violent than Honduras. It has just 8 million people, but with as many as 20 people killed there every day, it now has the highest murder rate in the world. It would be easy to blame drug trafficking. Honduras and its Central American neighbors have long served as a favored smuggling corridor for South American cocaine headed north to the U.S. But there are a number of factors that have contributed to Honduras' out-of-control killings. It involves not only geography but gangs and a government teetering on the edge of collapse. In this violent country, the most violent city is San Pedro Sula, where more than 1,200 people were killed last year. The outskirts of town are the roughest part. We were told that the safest time to drive there is in the early morning when the gangs are still asleep. As we enter the neighborhood of Rivera Hernandez, our driver tells us we should roll down our tinted windows so that people can see us. If they can't get a glimpse of us, it will make them more suspicious. He also crosses himself a couple of times as we enter the colonia, or neighborhood. Gangs fight viciously for territory here. Caught in the middle are residents who pay them so-called taxes, for everything from a safe bus ride to running a small shop. The gangs have hit the Oseguera family hard. We meet the mother, Angela Oseguera, and her sister Xiomara at the front gate of the extended family's modest home. The only men in the house are the aged father and an uncle. Xiomara Osequera tells us all the other men — her brother and three nephews — had to flee to Mexico. She says their problems began after a gang member killed her nephew and his girlfriend. The killer was jealous over the girl, who was just 17. Oseguera says the men in the family went to the police to report the murder, but somehow the gang got wind of the complaint. "We thought that we could trust the police," she says. "We don't know how that information got out and we don't think that we can trust them anymore." After that, the Oseguera men got text messages and phone calls, warning that if they didn't leave, their family would be killed. It's an open secret that organized crime gangs have infiltrated much of Honduras' police force. In San Pedro Sula, two main gangs hold sway: the Mara Salvatrucha and the 18th Street gang. Hundreds of the country's estimated 65,000 gang members fill the town's hot, overcrowded prison. During a visit to the prison, a man whose face is covered with a crisp blue bandana and who is wearing sunglasses strikes up a conversation. He won't give his name but lowers his bandana to show off the tattoos on his temples: an L.A. Dodgers logo on one side and "213" — the Los Angeles area code — on the other. Like thousands in his 18th Street gang, he was deported back to Honduras from L.A., where he says he lived for 20 years and where the gang got its start. For the past seven years he's been here, in this prison built for 800, yet housing 2,000. On this day, though, the gangs aren't fighting. They're holding separate press conferences announcing a truce. A man who only gives his name as Marco says his gang, Mara Salvatrucha, will no longer commit crimes, no more violence. They ask society and God to forgive them. Such a cease-fire in the war between the gangs is rare good news here. But for the truce to hold, the gangs say, they need the government's help with jobs and opportunities. Gangs aren't the only cause of the violence. Honduras' geography plays a role. It's a quick one-hour drive from San Pedro Sula to the Caribbean and Honduras' 400-mile, underdeveloped coastline, now the favored spot for South American cocaine traffickers heading north. According to the State Department, 42 percent of all cocaine headed to the U.S. and 90 percent of all cocaine flights now transit Honduras. In addition to Honduras' location, its government doesn't put up much of a fight. Migdonia Ayestas of the Violence Observatory at Honduras' Autonomous University says the government is weak. It's struggling to provide basic services, let alone patrol its borders. She says every other day the government declares a state of emergency about something, for example, health or education. "We are on the brink of becoming a failed state," she says. Corruption is rampant. Only 2 percent of criminal cases end in a conviction. The attorney general was recently suspended amid charges of corruption and incompetence. And the current police chief has been linked to extra-judicial murders and disappearances. There's a crisis of confidence, says Ana Pineda, the secretary of justice for human rights. She says the public doesn't trust the government. Most agencies collude with organized crime or use the institutions for their own political power and wealth, a situation many say has increasingly worsened since the 2009 coup that ousted the left-of-center president. Last year, the U.S. Congress held up funding to Honduras over concerns of alleged human rights abuses and corruption, particularly in the Honduran police force. Part of the funds are still on hold. However, the State Department continues to fund special police units it says it has closely vetted. Despite the violence, Honduras' economy continues to grow — about 3 percent this year. Agriculture remains the top money generator as well as an influx of foreign factories. In Tegucigalpa, the Honduran capital, the shopping malls are packed at lunch time. At the entrance of a TGIFridays — where wait staff toot horns for a customer's birthday — an armed guard checks you and your bags with a metal detector before you can come in. For now, the government has money and is paying its workers and building roads and bridges. In March, Honduras floated a half-billion-dollar bond and is spending the money — some cynically say — to create jobs and short-term wealth before this fall's presidential elections. The U.S. ambassador to Honduras, Lisa Kubiske, says now is not the time to turn away from the country. Nearly three times as many Hondurans were caught last year trying to cross the border over the previous one. Asylum claims have skyrocketed, too. "We think that the better route is to keep identifying the actors who are trying to make positive change and keep working with them," Kubiske says.